Hisense 65XT910 review | What Hi-Fi? Remind you of anyone? Looking at Hisense today, we can’t help but feel we’ve seen this all play out before. 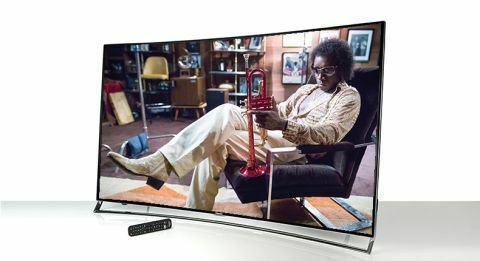 Hark back ten or so years, and imagine companies such as Samsung and LG in Hisense’s shoes: a reputation, in Europe at least, for creating cheap, entry-level televisions, whose prices initially challenged the industry’s status quo and then let the brands grow to become the market leaders they are today. You’d be forgiven, in fact, for not even having heard of Hisense – despite already boasting being the world’s third largest manufacturer of televisions, the Chinese company freely admits its star burns brightest in Asia and the southern hemisphere – but you’re certain to recognise some of those institutions alongside whom they are now making their name known. The box of this 65XT910, for example, showcases Hisense’s partnership with German football club FC Schalke 04, while its headline sponsorship of this summer’s UEFA Euro 2016 tournament in France assures the attention of millions of pairs of eyes around the world. Throw in official team partnership with Red Bull Racing and sponsorships of the Australian Open and within Nascar, and you’re looking at a serious portfolio and a company intent on dominating the market. Which is futile, of course, if you haven’t got the technology to back it up. And so, let Hisense present ULED. Yes, it runs the risk of sounding like the kind of OLED TV you’d buy off Derek Trotter for a pony, but is actually Hisense’s way of developing LED technology to bridge the gap between that and the aforementioned. It is, says Hisense, “a collective term for a suite of technologies that improves overall picture quality and resolves the key weaknesses of the platform – black levels”. Those technologies include its Wide Colour Gamut, which it claims to expand the panel’s colour spectrum by up to 25 per cent over many standard LCD TVs; High Dynamic Contrast, designed for greater contrast but also more pertinently for greater detail within dark scenes; a sophisticated backlight scan intended to reduce motion judder and blur; and 240-zone local dimming, which Hisense says, is like 240 different cameras trying to capture the image, thus allowing dark colours go deeper and light ones go brighter. Hisense is making quite a visual statement with its flagship model. You won’t have failed to notice the curve to both the set and its ultra sleek stand, but you will also need to take note of its laid-back posture. Feasibly, this means you needn’t worry about a television stand at all; giving such a wide set this kind of viewing angle could, depending on the height of your sofa, allow you to place it straight on the floor, negating a host of logistical and financial snags when it comes to finding it a sufficient perch. We’d of course recommend you shell out a little more for a low-standing table ­– especially if you have carpet, given the backfiring speakers will be pointing toward it – but the freedom to choose is handy. So essentially what you’re getting here is a fully kitted-out 4K and 3D telly, with HEVC decoding to support streaming Ultra HD content from Netflix, whose app you can access with just one press of the remote control’s designated button, and HDMI 2.0 (two of its four HDMI ports) and USB 3.0 (one of its three USB ports) for playing via external sources. We’d like it if there were more streaming apps – such as Amazon, ITV Player and All4 – but otherwise it’s almost as complete an arsenal as you could hope from a 65in set at this price. We start with Jurassic World on Blu-ray as our input, and enjoy a fine amount of detail with a natural-looking colour pallet (though what a natural colour for dinosaur is, we’ll freely admit we can’t be sure). As promised, there are good, deep blacks. Having already tested Hisense’s 55K321 entry-level Ultra HD set, we can confidently say this is a step up in all respects. You can’t ignore the contribution of the greater screen size and its curve to the difference in price between the two sets, but we are also satisfied the improvement in picture quality is enough to justify the extra expense. That said, the character of the two sets is remarkably similar; and the relative strengths and weaknesses of the two are pretty much in the same areas. In dinosaur chase scenes, for example, a slight lack of control over motion gives us a fair amount of judder; we turn the ultra smooth motion feature up to medium, which helps somewhat but leaves quite a bit of blur. What’s more, a lack of subtlety in shading leaves the depth a little shallow; it doesn’t wholly affect our enjoyment of the film, but there is a noticeable contrast when compared with other, more talented sets in this regard. There is a definite step up in terms of detail when we stream Marco Polo in 4K from Netflix; if Ultra HD is this set’s major selling point, you can be fairly satisfied generally with what you’ll receive. However, with the candlelight in 13th century Chinese temples not being all that vibrant, we’re left a little disappointed by the amount, or lack, of detail we get in those deep blacks. It is one of the areas in which Hisense says its ULED technology improves upon standard sets, but we’re left wanting more. We mentioned those rear-firing speakers, which, if you aren’t using a soundbar or surround package, require a little care not to let muffle, but allowing them to reflect off a hard enough surface offers decent results. You mustn’t expect dinosaurs in your living room, of course, but Jurassic World doesn’t lose its intensity or drama thanks to a full-bodied and well-rounded sound, which fills our test room without needing to be pushed to its limit. Musically it works too; we stream Daft Punk Unchained from BBC iPlayer and the 65XT910 is more than happy to bounce along with the French duo’s iconic floor fillers. But let’s not make this sound like an overly negative review; the 65XT910 performs well enough in every respect that we wouldn’t be rushing back to the shop for a refund. Its upscaling of standard and high definition broadcasts is good, the sound is loud and expressive enough that you won’t necessarily need to fork out extra for a soundbar and it is incredibly simple to navigate. Three stars here isn’t a criticism; this a decent set, about the level we saw from Hisense’s main competitors as they were breaking into the market a decade ago. We fully anticipate them following in those footsteps soon enough.